This piece was truly a diamond in the rough! At first glance my immediate thought was awesome, then I focused in and realized there were a lot of challenges with this piece and would take some time but it is January after all, and well here in Maine, we have time. Sometimes timing is everything and as it happened my mother shared a post in a Chalk Painting group with me that used the embossed method and I new immediately that this was the piece! Here at the nest we love to talk paint, projects and creative ideas. I knew everyone would love to see a how to do this project! So here is a step by step of the project. Below is a slideshow of the piece before beginning. The major issues were the veneer peeling, broken knobs, and key holes that appear tp have been dug out! Yikes, who does that! Also oil stains and cracks from time! We call them wrinkles in time! Step one: PREP. This is the most important part of any project. If you are going to spend your valuable time and money you want it to last. Anyone that tells you Chalk paint requires no prep work is not giving you good advise. The amount of prep depends on the piece. For this piece the prep work was critical. You cannot fix everything, nor should you. I like to breath new life into old pieces but I value the age and character that old pieces offer! To repair the veneer, I used wood filler to smooth out flaking veneer, peeling anything that appeared loose and about to peel. 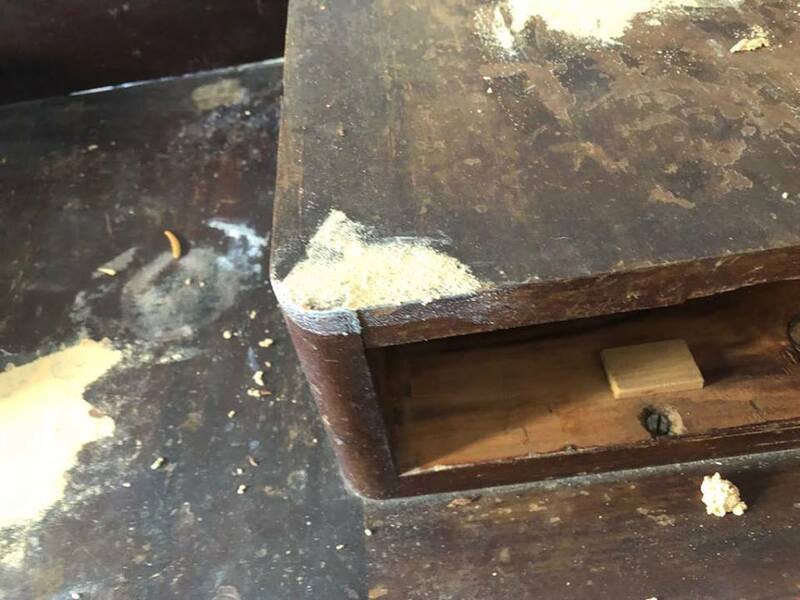 I then used wood filler to fill in the dug out key holes as these could not be saved. I removed the broken knobs as my vision was telling me glass knobs would be needed to complete the look! Next I removed the drawers and sanded any edges that were needed. 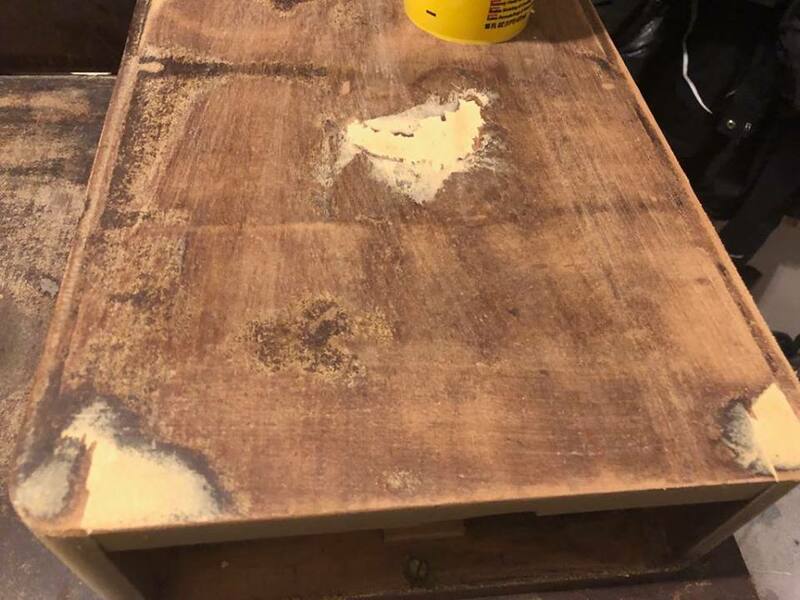 Depending where your piece came from, basement, garage, old home, storage or other, wood tends to swell as it absorbs moisture and shrink as it releases that moisture. Your drawers may not glide as you would like, so take the time to do this before you start painting. A wax rubbed on all drawer sides and edges will help them glide smoothly also! After this is complete sand off any excess wood filler and any rough parts on the wood. Now grab some dawn dish soap and water and clean your piece 100%! So important! Once clean, wait 24 hours and let it dry completely before moving to next step. ALWAYS plan on prepping your piece the day before you need to paint. Never rush this, your prep work determines how your paint will set and last! For this piece, due to dry time, this is where I also applied the embossed wallpaper to the drawers. Just follow the instructions on the paper it is simple and quick but requires 36 hours to dry before painting. This piece was a dark wood oil stain and I knew there was a strong risk of “bleed through” using a white paint. Sure enough the embossed paper told me what I had suspected. When dry the paper turned orange in many places because of bleed through! You do not want this t happen with your chalk paint. This is in the Photos below! The next step was to prime! You usually do not have to do this with chalk paint except when there are dark oil based stains! For this I used Zinger, The Pro’s Choice! Once primed, let dry 24 hours! You need to let it dry through and be sure that all bleed through has been covered! Click on the image below to see all prep photos! If you have patiently waited the 24 hour dry time, you are ready to finish this off! I chose Country Chic Simplicity Paint. Do one coat and let dry completely. I usually wait 24 hours before the 2nd coat to see if there are any bleed through spots. Thank fully there were not! If this happens, simply put a little primer or shellac over the spot, let dry, cover with paint. I then apply a second coat and let it dry completely. Then do a light sand with a 220 sandpaper to get a smooth surface!. Identify any touch up area and take care of those.. Once you have the second coat complete and you are happy with it, let it fully cure for 24 hours! You are now ready to wax! For this I used a Country Chic Pearl Wax, as I wanted this to piece to shimmer slightly. I use the country Chic wax brush and a lint free cloth. Brush your wax on and smooth out and remove excess with the cloth. If you have used other waxes before, you’ll likely notice this is quite different than most others on the market. This wax doesn’t contain chemicals, whereas most other waxes on the market do contain them. Most people find Country Chic wax not only easier to use, they also like that it is a completely safe and non-toxic product. It actually smells really nice! Wax will slowly wear off the surface, so it’s recommend you apply new wax about once or twice a year. You are now ready to finish your piece with hardware, put it all back together and enjoy! You did it! Just beautiful! Below are photos of the finished product!